BOOM! BELLOW! BLEAT! and other spring cacophonies! Anyone who thinks that it’s quiet in the country has not spent time at my house. Right now the spring peepers are peeppeeppeeping outside my window. Soon the chorus frogs will join in, followed by toads and gray tree frogs. When summer starts, there’ll be green frogs and bull frogs. And of course, the birds serenade from sunup to sundown, with red-winged blackbirds leading the pack right now. 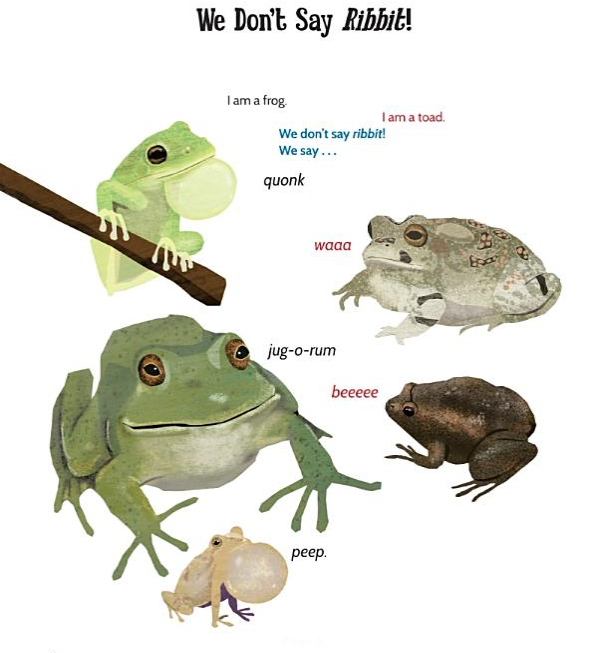 I can imagine a classroom filled with alternating choruses of froggy sounds! The book’s noisy journey continues with geese, fish, mockingbirds, rattlesnakes, honeybees, and more. 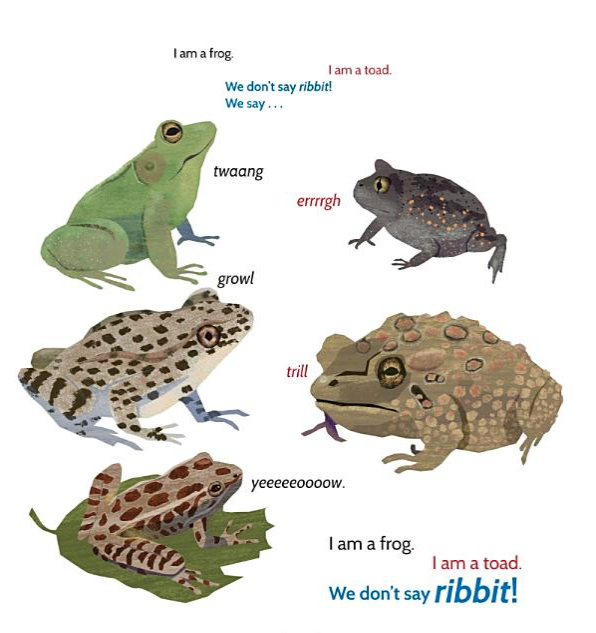 Backmatter gives more details about the animals and the function of their sounds (I was pleased that Georgia wrote that toads are actually a type of frog, addressing a common misconception. And did you know that a big claw snapping shrimp makes a sound that is louder than a jet engine? I did not!) The poems in this book beg to be read aloud with a whole passel of kids. This April I’m planning to read and review more poetry books, and to use the books as inspiration for my own writing. Liz Steinglass and I are once again exchanging daily poems. There’s nothing like knowing that someone expects you to write something to get yourself going! Stand quietly on the marshy shore. It’s echoed by another and another. invisible to your human eyes. The poem continues with other animals that are hanging out at the vernal pond across the street from my house, and more peeping. In the poem, a peeper is finally spotted. My camera and I hope to be successful in real life, but so far they have sung and sung without my locating one! There’s lots of April poetry goodness flying around the internets. Head over to Karen Edmisten’s blog for the Poetry Friday party and a John Ashbery poem. This entry was posted in Uncategorized on April 5, 2019 by Buffy Silverman. So glad you called out this beautiful book! Cunning little creatures, making as much noise as they way and still remaining hidden! I like the rhythm of your narrative, with the “wait” building suspense. I am in love with how the words and illustration work together on these pages. Gorgeous! I’m not a drinker…but jug-o-rum has to be my favorite. Thank you so much for introducing this book to me today. Thanks for sharing Georgia Heard’s new book and your poem. I enjoyed hearing the spring peepers in your poem as we haven’t heard them yet on our bike rides. Georgia’s new book looks great- so much wonderful onomatopeia! Your poem is lovely, with vivid images from your walk. You took the reader right along with you. How wonderful! I do hope kids of the future will still get to hear the wonderful sounds frogs make. I feel pessimistic about that when I read the stories about frogs in the news! Georgia’s book sounds fantastic. Love the sample poem you shared. Enjoyed hearing about your peeper adventures and reading your poem. 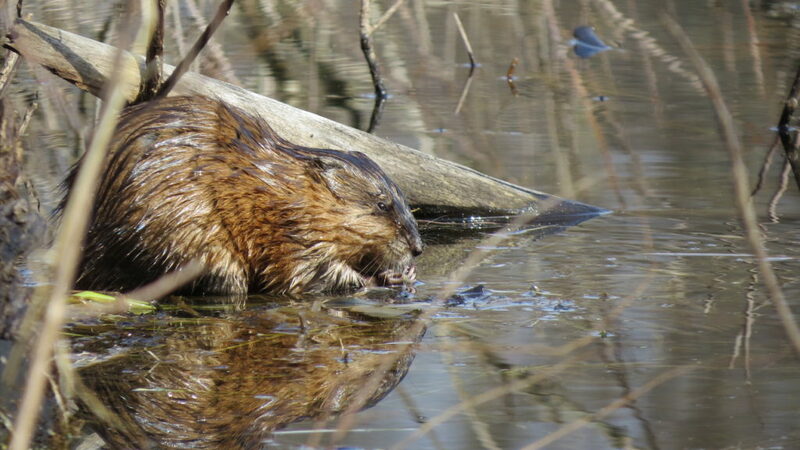 How fun to spot a muskrat! One of the highlights of spring is searching for those peepers! I’m still waiting to hear them here. I can’t wait to explore Georgia’s new book and your poem is brim full of spring-time energy. I love that you’re exchanging daily poems with Liz. What a great way to challenge yourself! I love Georgia’s new book, know it will be a ‘rousing’ success with a crowd of kids. And love that you’re trying your own sounds poem, key word here, “invisible”. It’s even hard to spot a big frog, much less those peepers. Have fun with your exchange with Liz, Buffy! I love this, Buffy! So full of sound and great imagery. Very nice!